Fun with Daiya, a Confession, and a Giveaway! At the end of the post, I have a free product voucher that I’m giving away to a lucky reader, if one exists (see below). 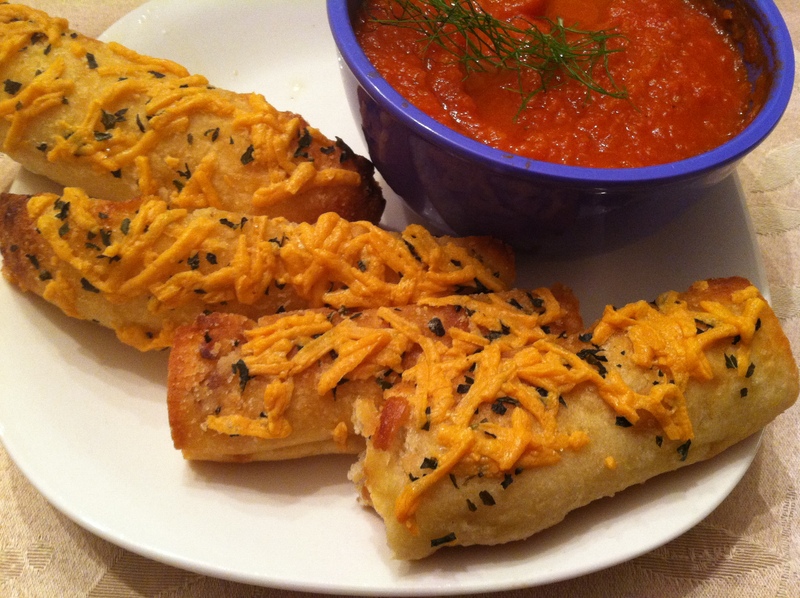 I am a longtime fan of Daiya’s vegan cheese shreds, and have used them for years on everything from pizza and grilled cheese to burritos and quesadillas (the pepper jack flavor is particularly awesome for this use, btw). 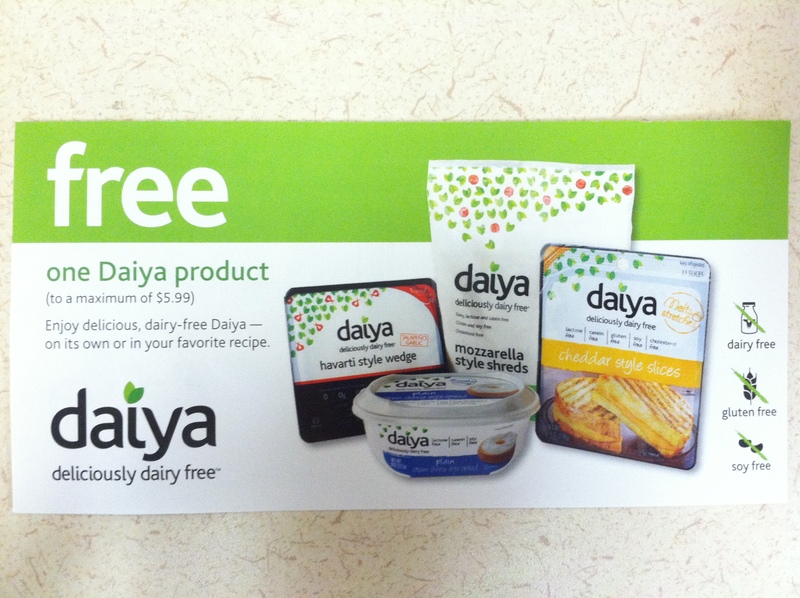 All Daiya products are dairy free (obvs), gluten free, and soy free. 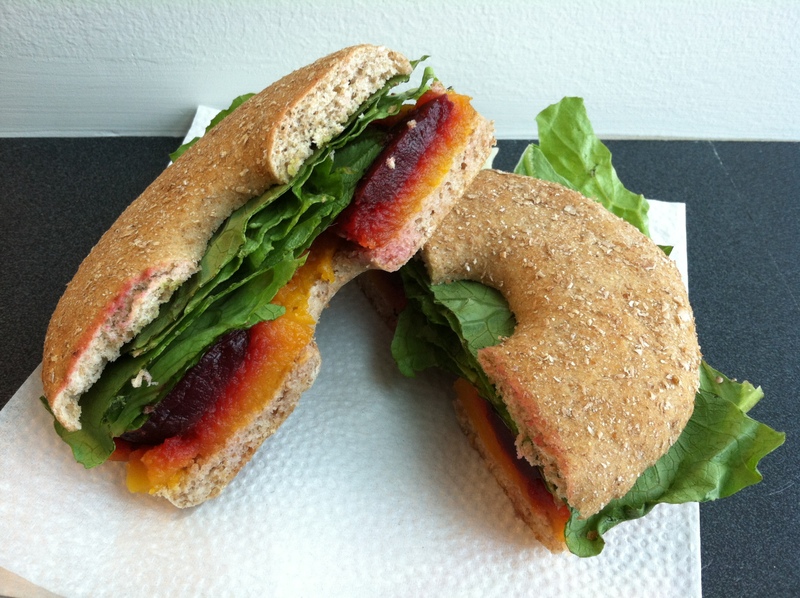 The first thing to do, obviously, was spread it on an everything bagel. And add a tomato slice. I really enjoyed the cream cheese spread. 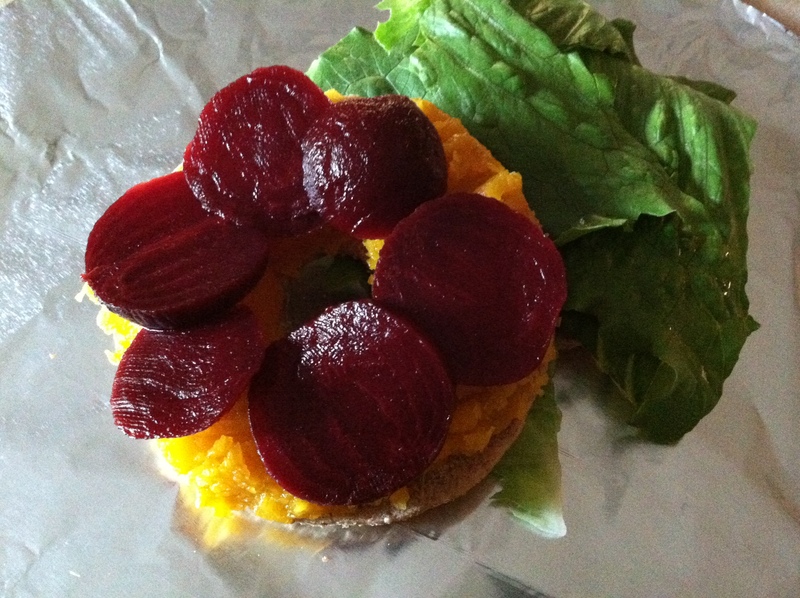 Before applying it to the bagel, I tasted it plain and my first thought was that it tastes like Daiya. I mean, duh, right? 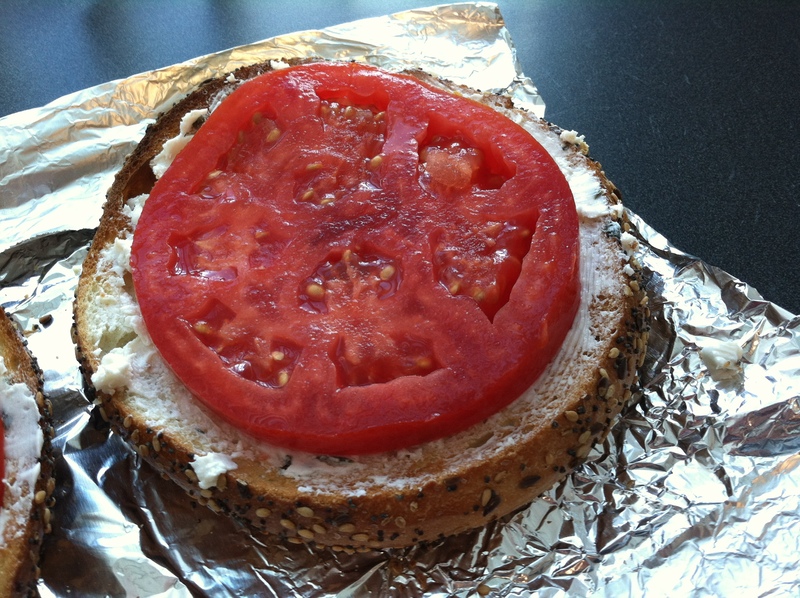 But if you’re familiar with the ubiquitous mozzarella style shreds, then you can easily imagine the taste I’m talking about…mildly sweet, a little tangy, plus this particular one also has a subtle oniony flavor that went perfectly with the flavors of the bagel and tomato. 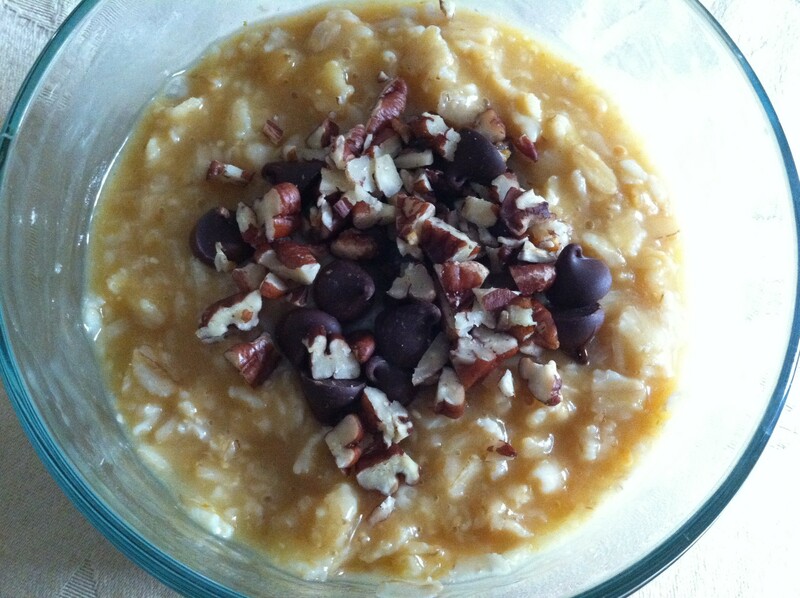 This makes a great, quick vegan breakfast for a busy workday morning. 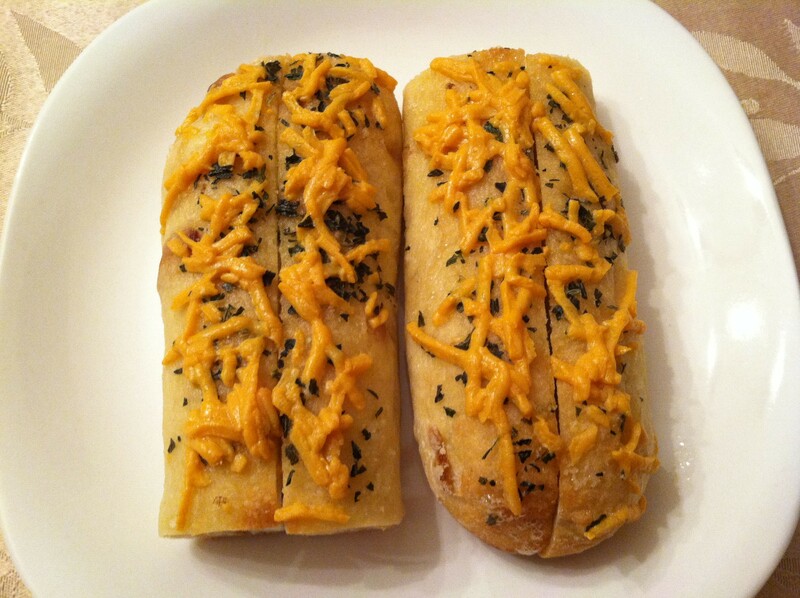 To make these, I simply took a small roasted garlic ciabatta loaf, sliced it into four pieces, then spread each piece with Earth Balance and sprinkled it with garlic salt, Daiya cheddar style shreds, and dried basil. I toasted it at 350 in my convection toaster oven until the shreds were melted and was rewarded with these. So, cream cheese on a bagel and cheese shreds on bread are nothing revolutionary. 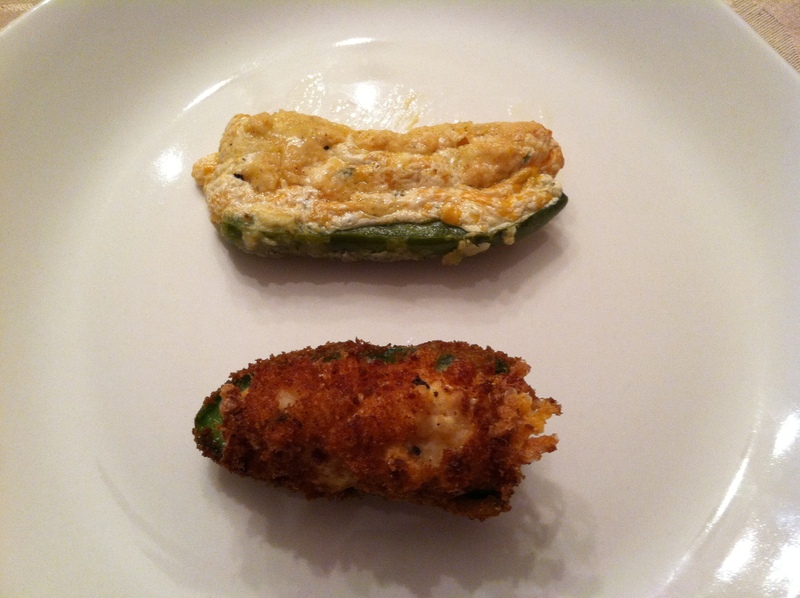 Worry not; I did attempt something a little more bold with these two products, and producing some pretty outstanding Daiya Jalapeño Poppers. I fried half of the peppers and baked half of them. The recipe below contains instructions for both methods. 1) If baking, preheat the oven to 350F. Lightly grease a baking sheet and set aside. If not baking, begin with step 2. 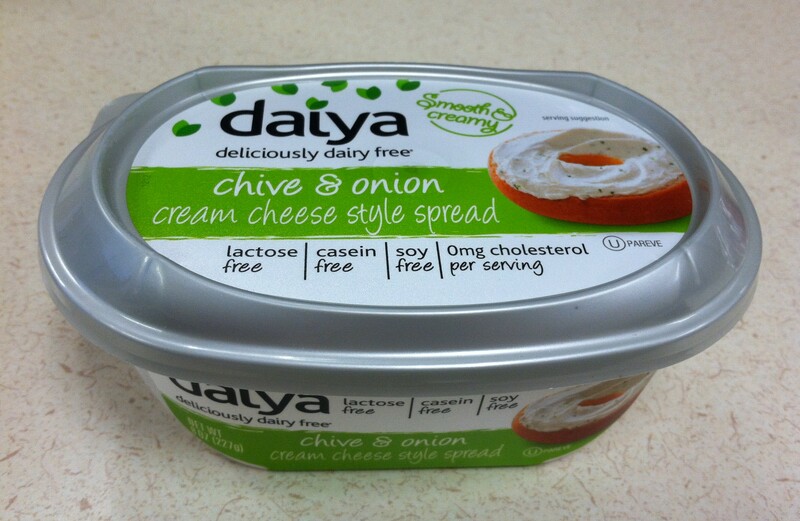 2) In a bowl, cream together the Daiya cream cheese style spread, Daiya cheddar style shreds, and cumin. 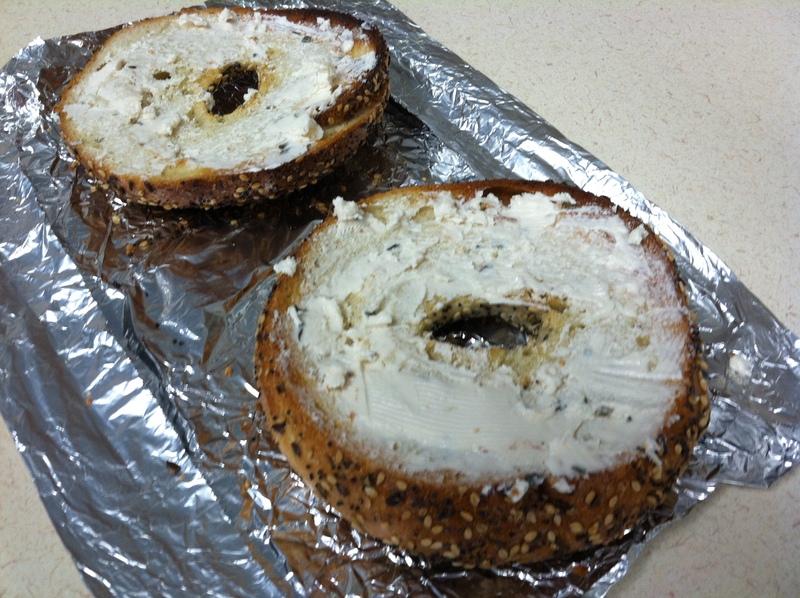 Use a spoon to fill each pepper half with the cream cheese mixture. 3) Place flour in a separate shallow bowl, then add salt, pepper, paprika, chili powder, and garlic powder and stir until well combined. Place non-dairy milk in yet another small shallow bowl. 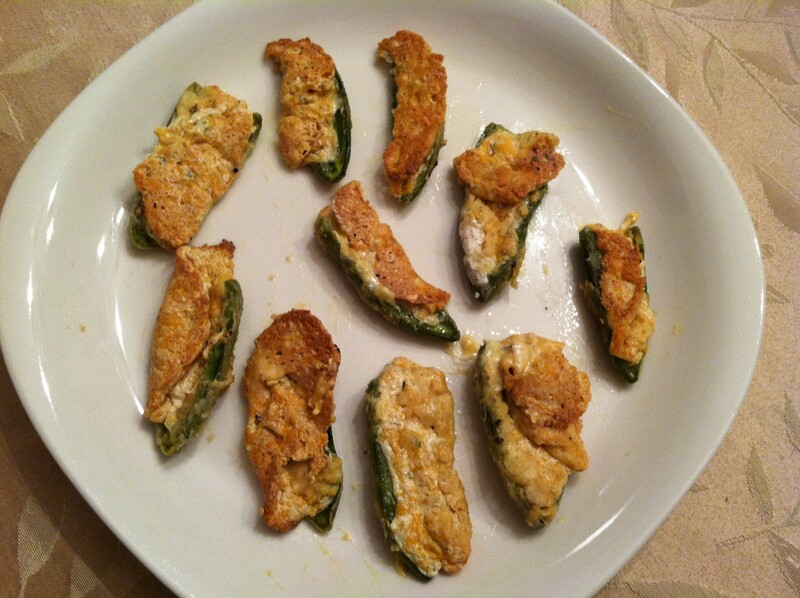 For baked poppers: 4a) Carefully dip each stuffed pepper half in the milk and then dredge in the flour. Place coated peppers cut side up on the baking sheet and bake for 30 minutes, until the filling is gooey. 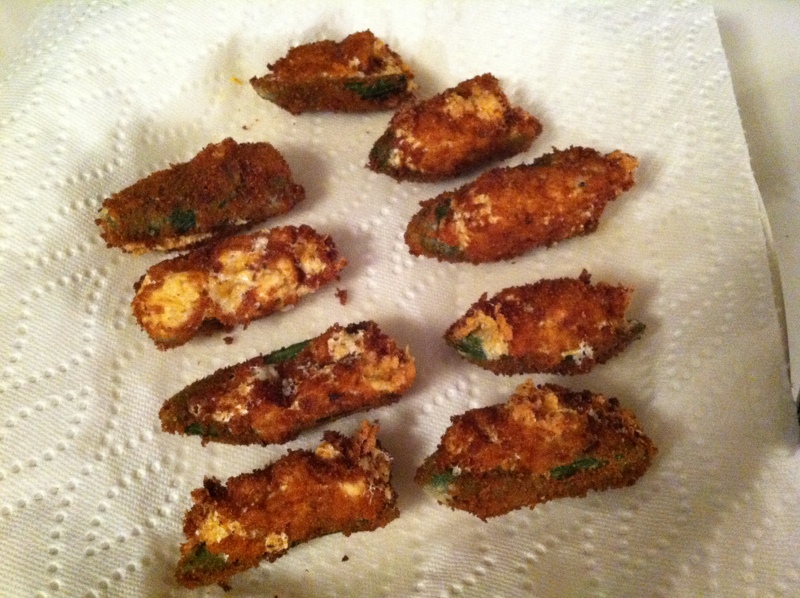 For fried poppers: 4b) Carefully dip each stuffed pepper half in the milk and then dredge in the flour. Place floured peppers on a baking rack and let them dry for about 10 minutes. While they are drying, place bread crumbs into a separate bowl. 5) When the peppers are dry, dip them again into the milk and then roll them in the breadcrumbs. Place them back on the baking rack for about 5 minutes while you heat up the oil. 6) Heat the oil in a saucepan over medium-high heat. I used a 3-quart saucepan and filled it with just enough oil so that the peppers would be submerged. If you have a thermometer, the oil temperature should come to about 350 degrees. If, like me, you don’t have one, then simply test the oil by adding a tiny pinch of breadcrumbs to it. If the oil bubbles around the crumbs, it’s ready for frying. 7) Add the peppers to the hot oil one or two at a time and fry until the coating is golden brown. Be really careful to avoid spatter! I fried each pepper for exactly 1 minute; this was all they needed. It shouldn’t take more than 2 minutes regardless if your oil is properly preheated. Remove from oil and drain on a paper towel. I wish I had better pictures to show you, but I was in a hurry to eat these because they smelled SO GOOD and because they really do need to be enjoyed hot. H and I ate them during Sunday Night Football so the darkness didn’t help either. But trust me, they were absolutely delicious. The baked poppers had kind of a chewy crust that reminded me a little bit of the outer edges you would get on a well-done omelet. I thought it might taste kinda burnt but it actually had a ton of salty flavor that I loved, and did a good job protecting the gooey insides from spilling out everywhere. The baked poppers were for some reason spicier than the fried ones. The fried peppers were a little more al dente, but the filling and breadcrumbs stayed put beautifully. The filling also stayed soft and melty throughout. H and I agreed that we both liked the fried poppers better, but in a way that’s like saying you’d rather sleep in on a Saturday morning than go to the office. Deep fried is going to taste better 10 times out of 10. I do think that the next time I make these (and I will be making them again) I will use bread crumbs on the baked ones too, because I think that was another factor that gave the fried ones the edge. 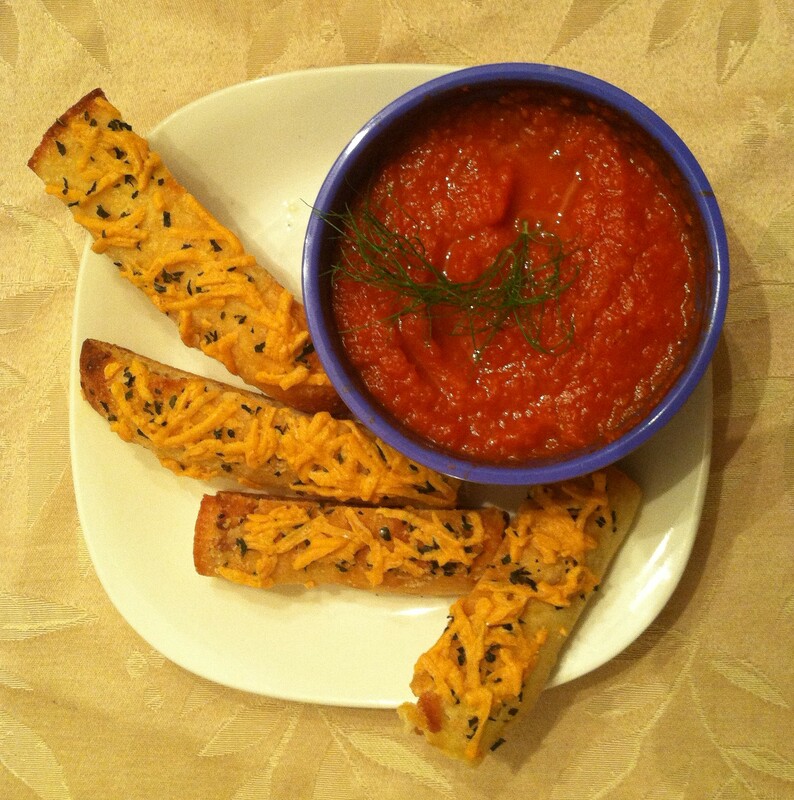 For more ideas of what you can do with Daiya products, visit their recipe page. As I mentioned way back at the beginning of this post, I have a free product voucher from Daiya Foods (good for any Daiya product up to a $5.99 value) that I will mail to you if you win. All you have to do is leave a comment on this post telling me what product you most want to try. Open to residents of the U.S. and Canada only. This is the first time in over 5 years of blogging that I’ve ever attempted to give something away, or really even had something to give away. I have actually been feeling pretty nervous about doing it, and have even procrastinated putting up this post, because I’m insecure that no one apart from, like, my dad reads my blog and I’ll get no comments. No seriously! But I finally figured that worst-case scenario is that no one comments and I get to keep the voucher for myself. So I’m going for it! Enter if you want free stuff! I will select a winner with a random number generator in the next week and notify that person by email by the end of the day on Wednesday, November 6. It’s a Great Time to Be a Vegan! I seriously just had one of the best vegan weeks ever. Last weekend, H and I went down the Cape and headed over to Wellfleet’s Oysterfest with a bunch of our friends. And wouldn’t you know, in the middle of an oyster-themed event, they had a vegetarian vendor! 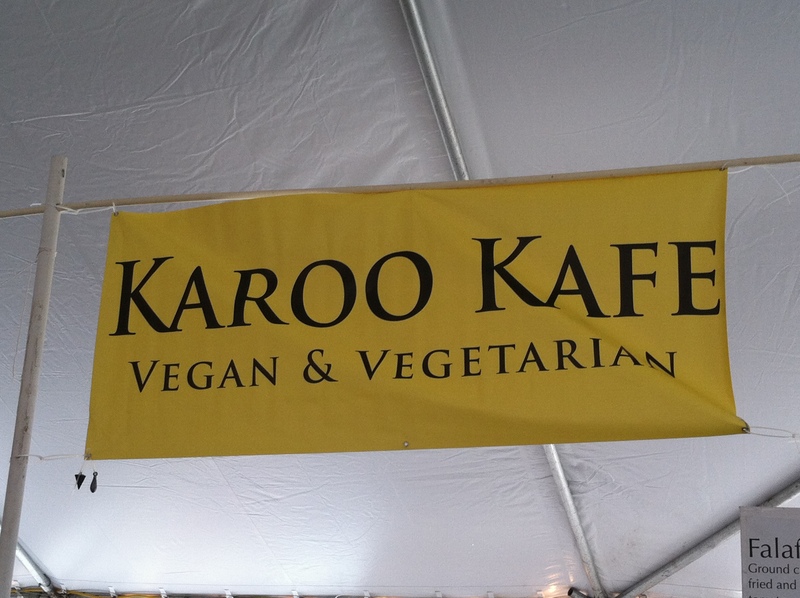 Apparently Karoo is an omni South African restaurant in Eastham with tons of veggie options, but for Oysterfest they only brought the veggie stuff. The menu looked so good (and was 100% vegan)! 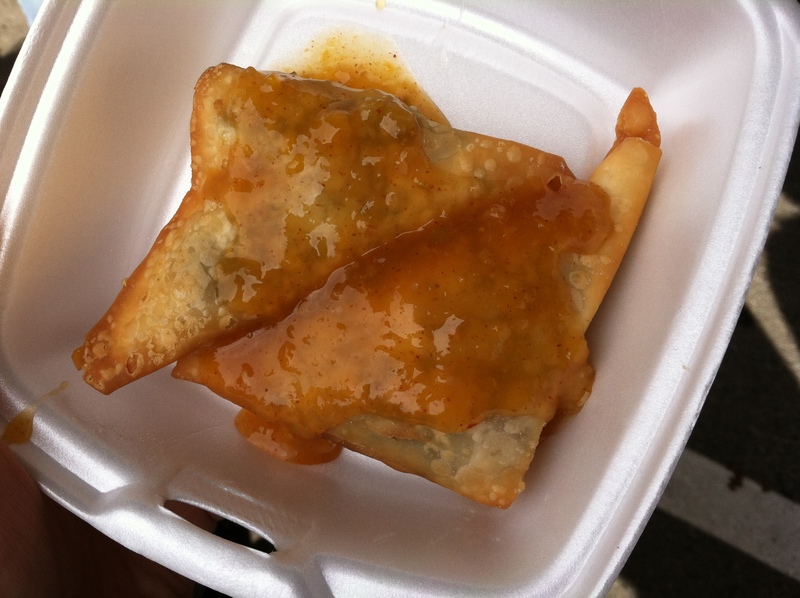 H and I split the samosas, which were DELICIOUS, especially topped (okay, doused) with sweet fruity chutney. 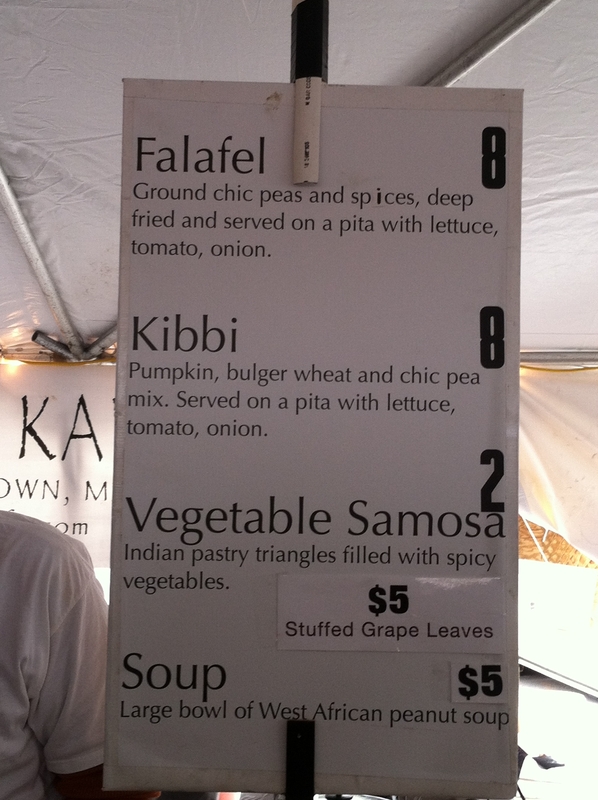 I’ve had vegetarian kibbi (or “kibbeh”) a hundred times but I’m not sure I ever had one made with pumpkin. It was really good! Most of all I was so excited to find a new vegan-friendly dining option on the Cape! 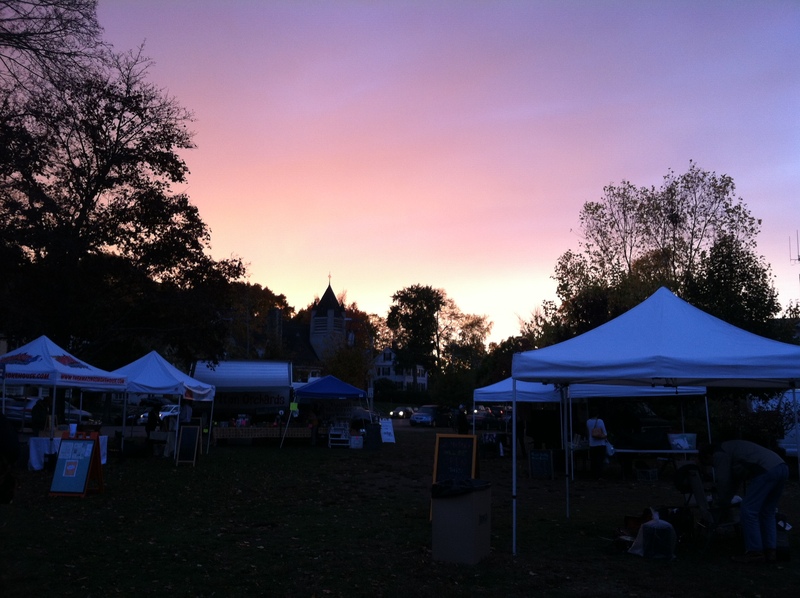 Then on Tuesday, I went to the farmer’s market, where I bought incredible local rainbow chard and apples, and saw the most beautiful sunset. There was also a full rainbow over the market, but I only took a mental picture of that because photographs of rainbows never really capture that moment. 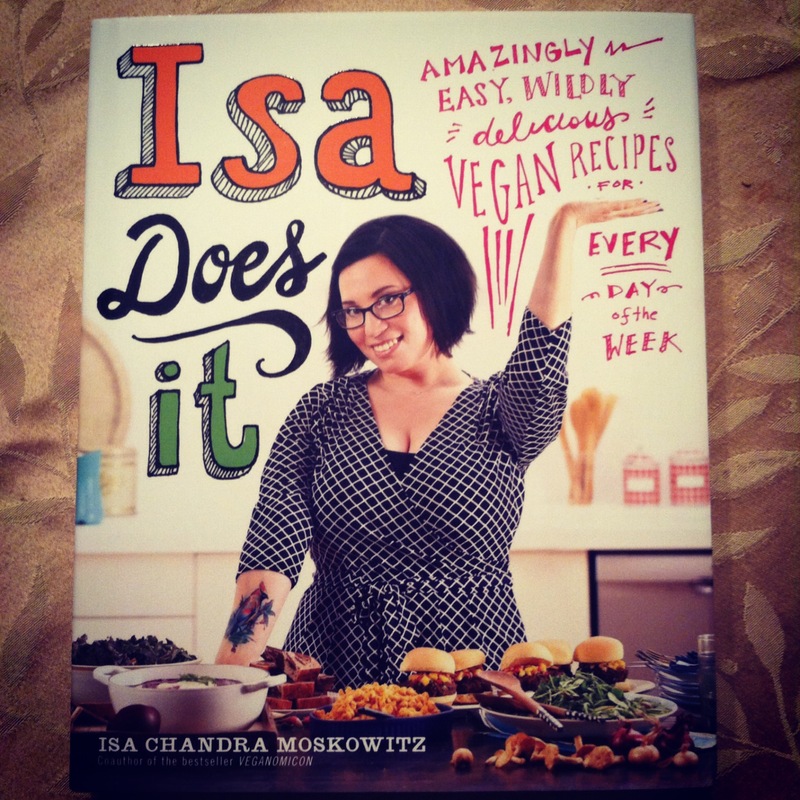 Ahhhhh I have been so excited for Isa’s new book and it’s finally here! I would buy anything this woman writes, truly. She is brilliant and hilarious, and this book is amazing. It is full-color with truly stunning photography and styling, and obviously the recipes are just so on-point. I’m about halfway through (yes, I always read my cookbooks cover-to-cover) and I’ve already bookmarked more than I can count. One of my biggest goals this year (which I have actually managed with some success!) is to make dinner for H and me most weeknights. I know this book will help with that and I can’t wait to start cooking out of it. I also enjoyed some downright delectable food this week. One of H’s co-workers brought a box of his homegrown squash to work one day, which resulted in us having a butternut squash in our kitchen that must have weighed 5 or 6 lbs. I roasted it early in the week and we’ve been eating it six ways to Sunday since then. I also toasted the seeds and those have been an additional delight. 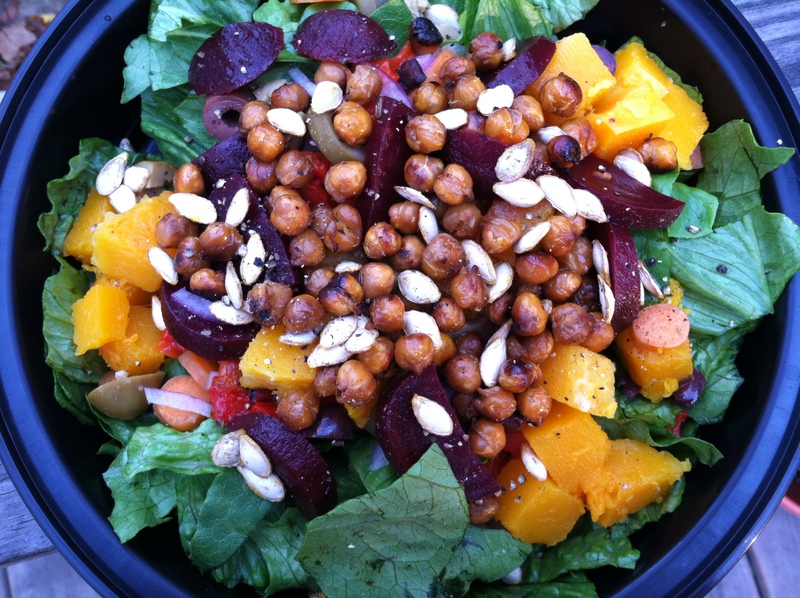 This contained a bunch of local produce (romaine, carrots, and red bell peppers which I roasted) plus the squash and its seeds, tamari roasted chickpeas, baby beets, red onion, and olives, topped with a drizzle of garlic-infused olive oil. Thursday night H and I watched the Red Sox dominate Game 1 of the World Series while we enjoyed one of our new favorite weeknight recipes, Butternut Squash Mac ‘n’ Cheeze from Oh She Glows (click for recipe). I am obsessed with this recipe. I always prepare it with some steamed broccoli or another green and add liberal amounts of smoked paprika and cayenne pepper to it. If you already have a roasted butternut squash on hand like I did, you can make this in as little time as it takes to cook a pot of pasta. It’s absolutely perfect and we both love it! So as you can see, it’s been a terrific week filled with wonderful vegan things, but it’s not over yet! Tonight H and I are going out to dinner to celebrate our two-year anniversary at The Elephant Walk, a French-Cambodian restaurant in Boston that has really excellent food and atmosphere, and a large portion of their menu is or can be made vegan. Tomorrow and Sunday is the Boston Vegetarian Food Festival and I am SOOO excited!!! I plan to show up with an empty stomach and a full wallet and leave in exactly the opposite condition. If you are anywhere near Boston this weekend you HAVE to check this out! The running cliche is that vegans will make bacon out of anything. 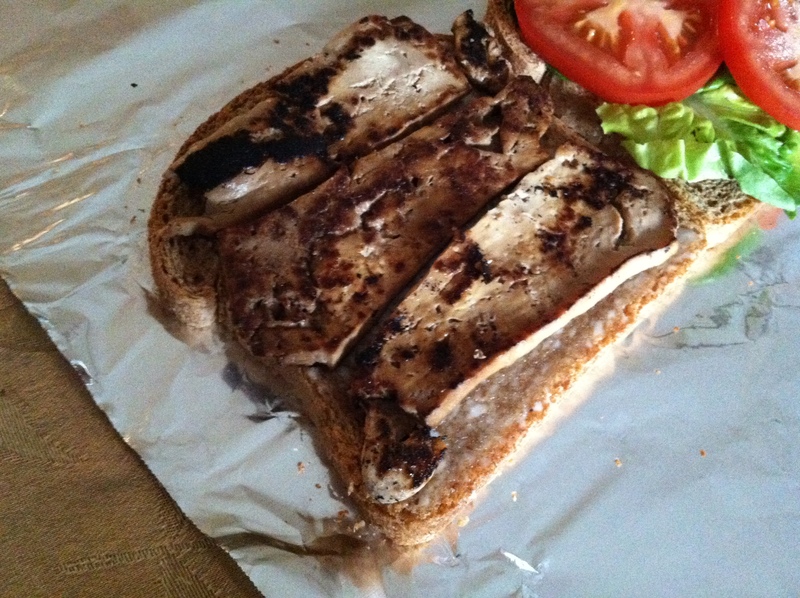 A brief glance at the blogosphere certainly supports the theory, as it is overflowing with ideas on how to make a vegan version of the ubiquitous salty-sweet topper out of coconut, shiitake mushrooms, eggplant, and, of course, tempeh. But I have a new obsession: tofu bacon. While it’s probably the most stereotypically vegan-sounding of all, it’s also so super-simple and so super-cheap that I now find myself making it all the time. This is what you do. Press your tofu (I usually do half a block at a time), then slice it nice and thin. It probably isn’t strictly necessary to press it, but I think pressing helps the tofu soak up more of the marinade’s flavors. Get out some sort of container in which you can lay out the tofu strips in no more than two layers. Dump in enough low-sodium soy sauce to just coat the bottom (the exact amount will depend on the size of your container). Then add 2-3 dashes of liquid smoke and 1/2-1 tsp. of maple syrup and swirl it all around until combined. 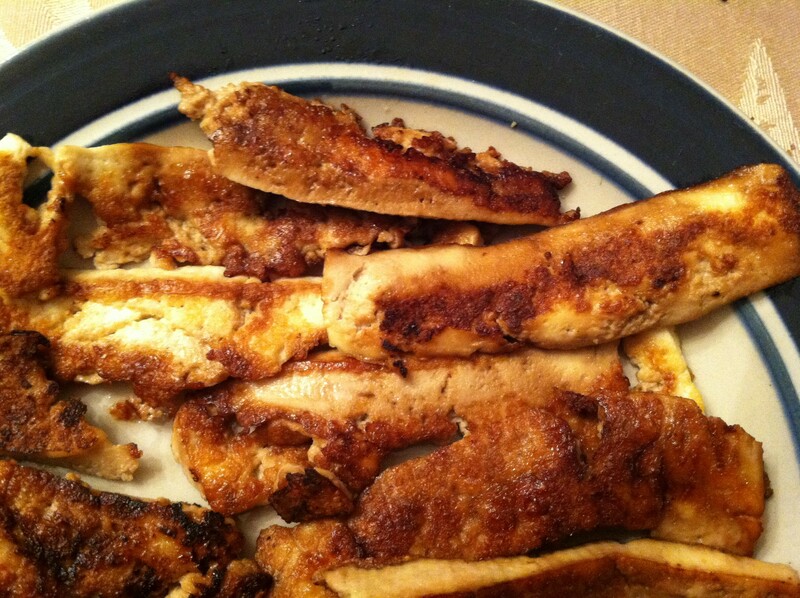 Lay the tofu strips side-by-side in the mixture. If they all fit in one layer on the bottom of your container, then you’re done! If you have to go to two layers (I always do), then shake a little more soy sauce, liquid smoke, and maple syrup over the top. Cover and refrigerate for 30 minutes to overnight. Then you just spray a pan with cooking oil and pan-fry the strips for a couple minutes on each side until browned and a little crispy. 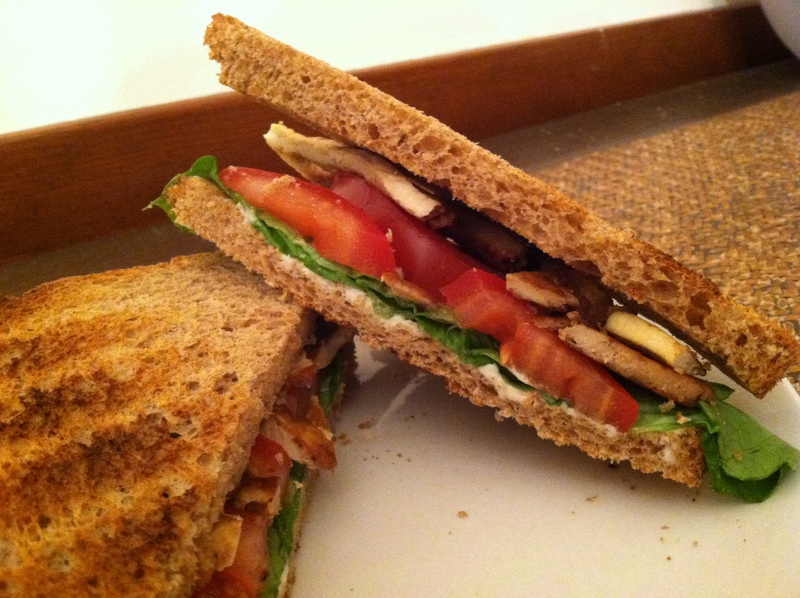 My favorite way to eat this is as a TLT on toasted whole wheat, with a little bit of vegan mayo spread on there. I’ve also had it with red onion slices and it rocks. Also, the tomatoes and lettuce are from our farmstand, and their incredible fresh flavor combined with the smoky-sweet tofu bacon makes this my absolute favorite sandwich of the moment. 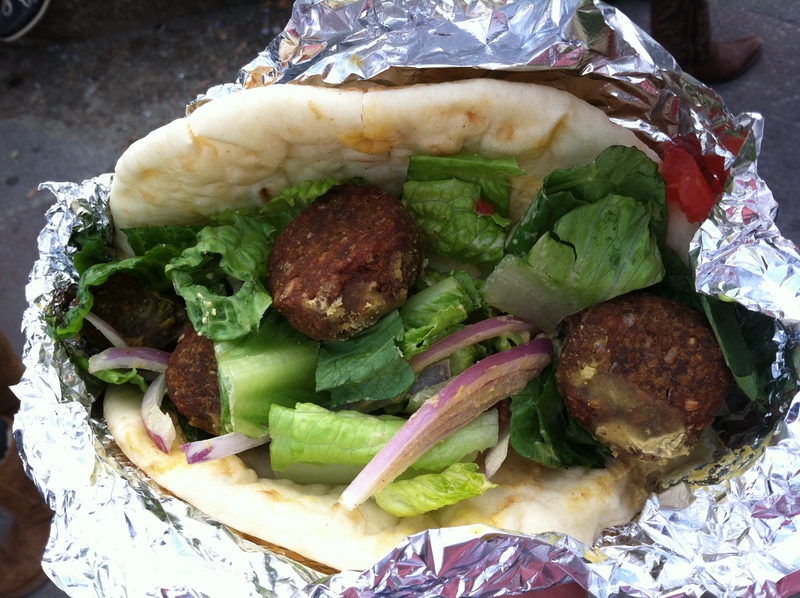 Don’t forget–Boston Vegetarian Food Festival is coming up this weekend!!! Over the summer I dedicated an entire post to smoothies and salads, but now that it’s fall my appetite is running toward the warmer end of the breakfast spectrum. This means that oatmeal is back in the rotation (how 2009, I know), as well as a number of baked goods (which I at least try to keep on the healthy side). 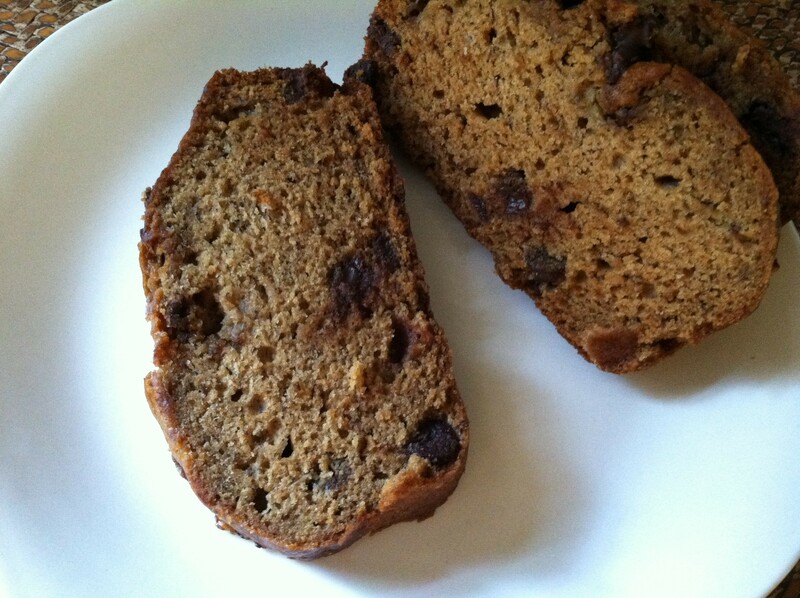 Over the weekend, I made the Lower Fat Banana Bread (with chocolate chips, OBVIOUSLY) from Veganomicon for a football tailgate. 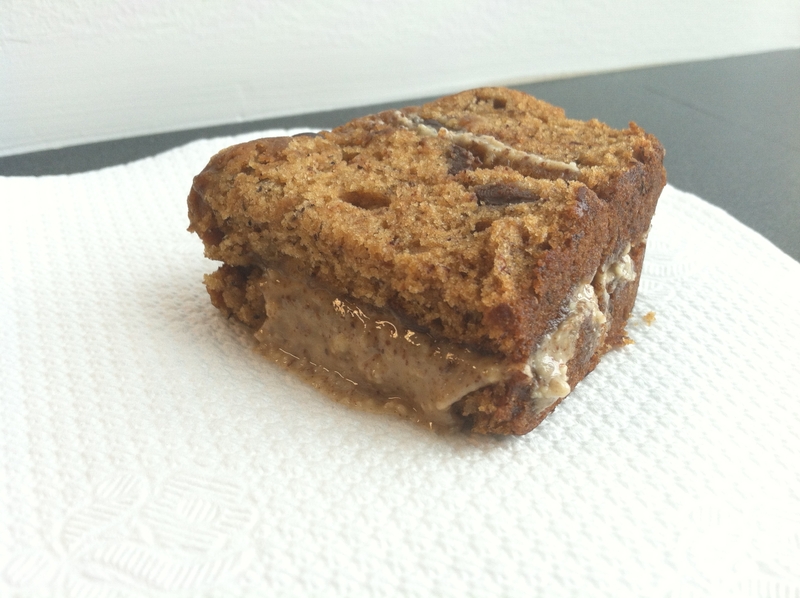 Portable workday breakfast: slice of chocolate chip banana bread with raw almond butter. Perfection. 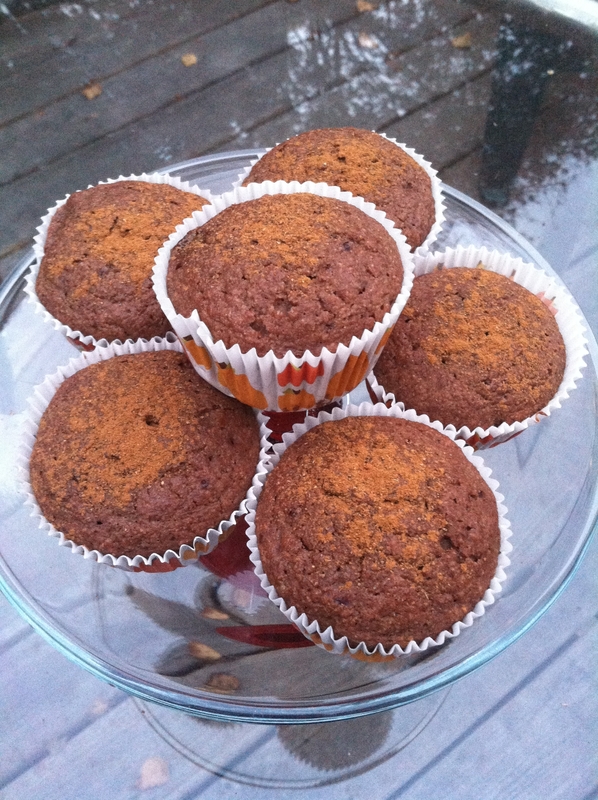 I also baked a batch of Chocolate Spice Muffins from Everyday Happy Herbivore so that H and I could have a quick, low-cal, grab-and-go breakfast every day this week. As with the banana bread, I like to cut these in half and spread a little raw almond butter on them. Obviously this ups the calories considerably, but I am the kind of person who is ravenous by 10:30 a.m. if I don’t bulk up my breakfast a little. ^Pretty hard to argue with. 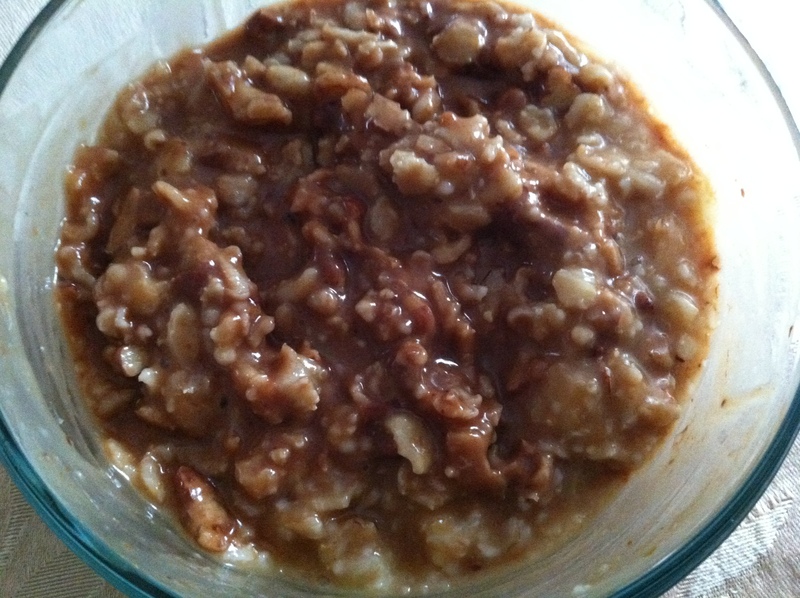 Simply cook the oatmeal, then stir in remaining ingredients and enjoy! Oatmeal never did photograph nicely. Oh and just in case you didn’t already know, the Boston Vegetarian Food Festival is coming up in less than two weeks!!! Ahhh, you guys, I love October!! Not only is it the month of my anniversary 🙂 but in my opinion it’s also the quintessential autumn month. It’s not too cold yet, but each day it becomes increasingly clear that summer is definitely over. Like everyone else, this time of year I gravitate toward cozy food and drink. 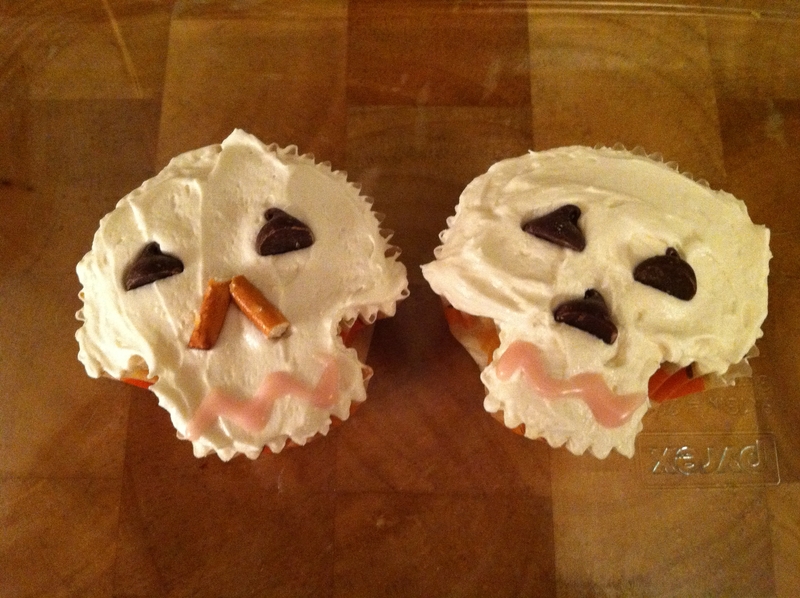 And, of course, baked goods! There is nothing better than warm, spicy-sweet aromas drifting through your house. Nothing. The craving for in-season produce like squash, pumpkin, etc. comes pretty naturally to me, but being a blogger adds serious fuel to the fire, as I spend a portion of each day ogling photos of all the delicious things that my virtual friends are concocting all over the world. I read and bookmark away, and then later decide what I’m going to actually make by factoring in time, ingredients I already have, etc. So even though I’ve been doing this for the past several weeks (and let’s face it, years), this week the baking bug finally bit me hard enough that I just dove right into it. Check out some of the results! 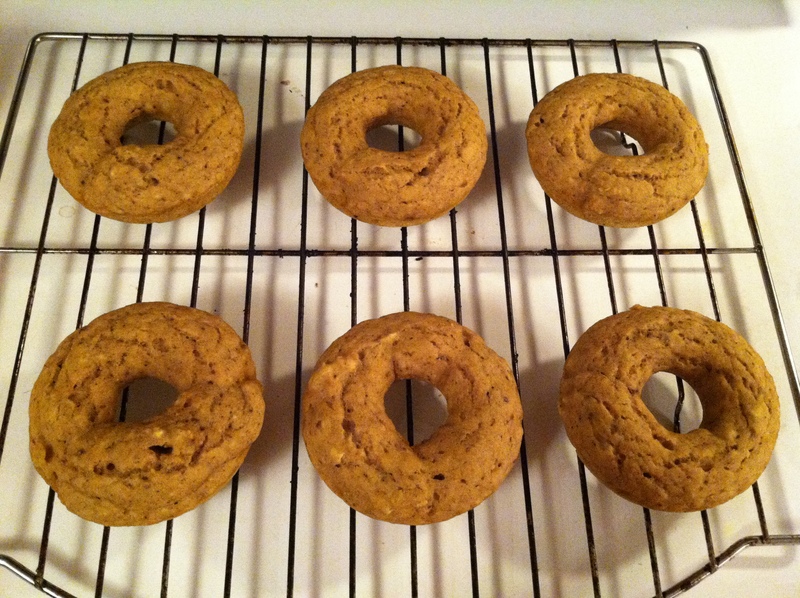 And I don’t think I even need to tell you how good these smelled during and after baking. Yum!! 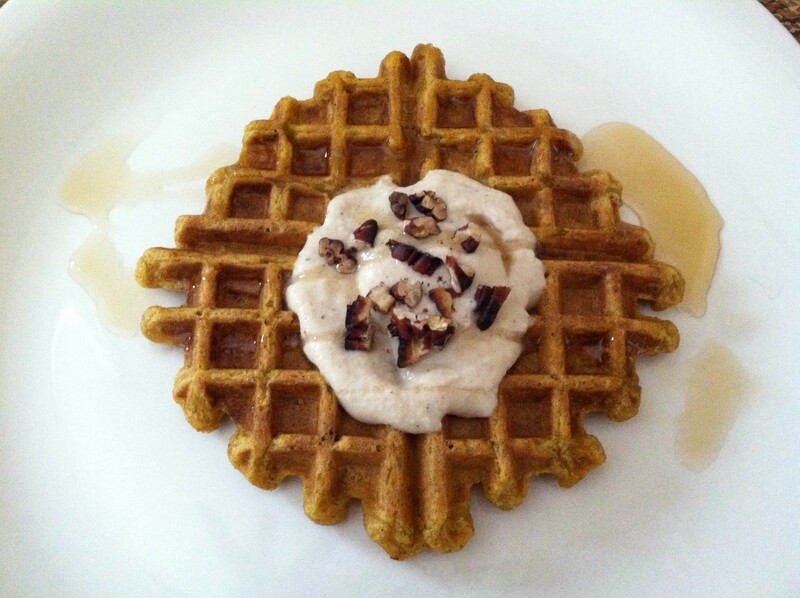 Next I made Pumpkin Waffles with Maple Cashew Cream by Sarah of The Sweet Life blog (click for recipe). 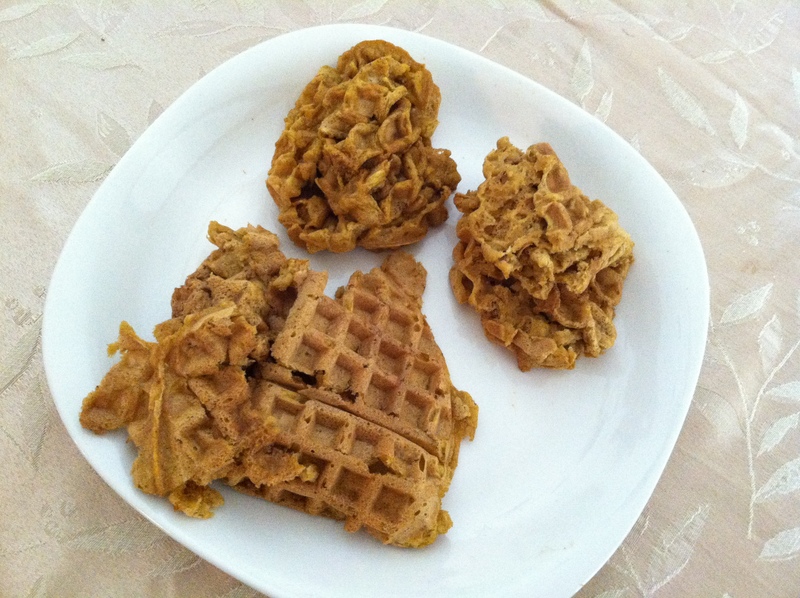 Once I had figured out how to actually make normal waffles, I really enjoyed them! 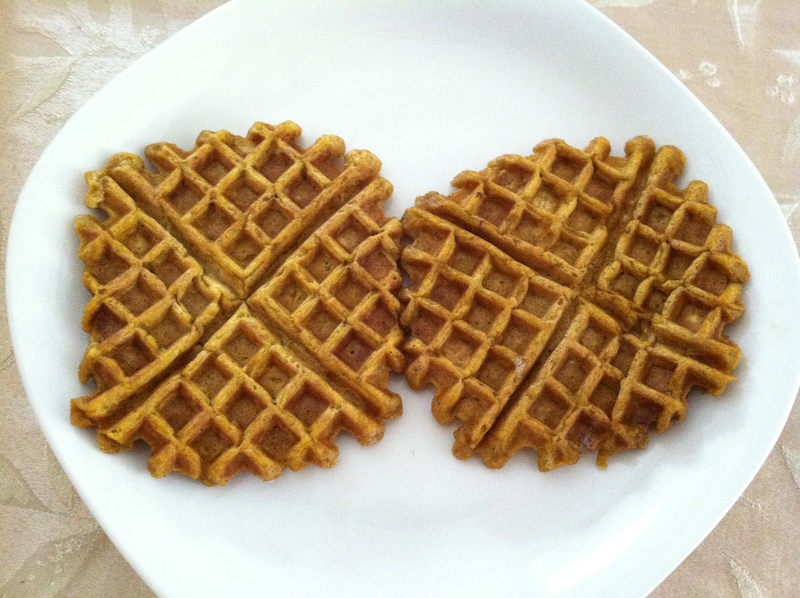 The waffles were soft, lightly sweet and not-too-pumpkiny, and surprisingly filling. This was a really fun and delicious fall breakfast for H and me. And worry not! I didn’t throw out the ugly waffles. 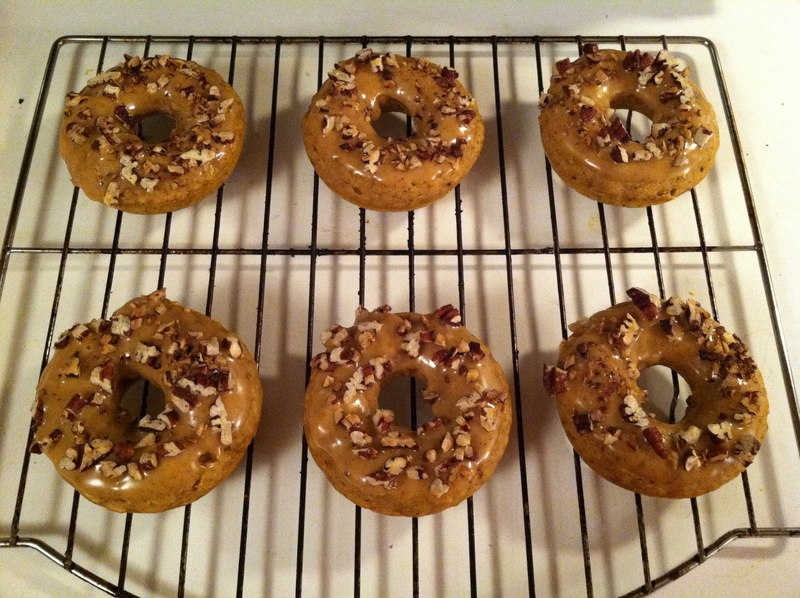 No, I made “waffle ball sundaes” out of them by warming them up and then topping them with leftover maple cashew cream AND leftover pumpkin glaze from the donuts, plus toasted pecans. BOOM. That’s how we come full circle. I may have gained 10 lbs. this week. 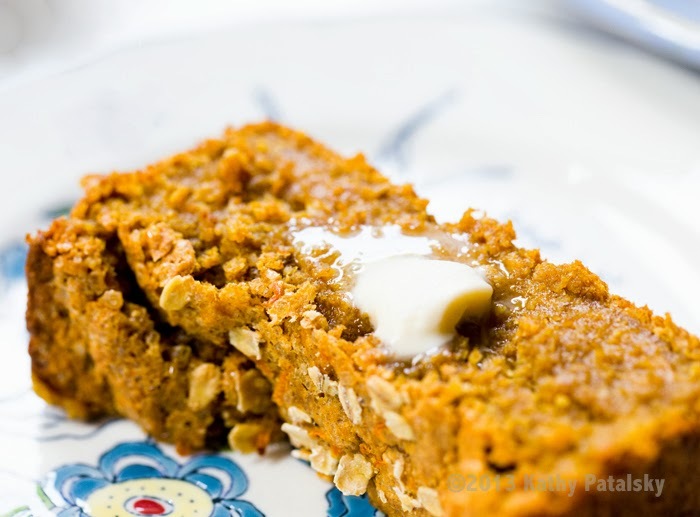 The next thing I am dying to try, but just haven’t yet had the time to, is this Oatmeal Pumpkin Loaf by Kathy of Happy. Healthy. Life. (click for recipe). I’m just posting about it in case anyone isn’t aware that this exists and wants to get a jump on making it. That’s all. 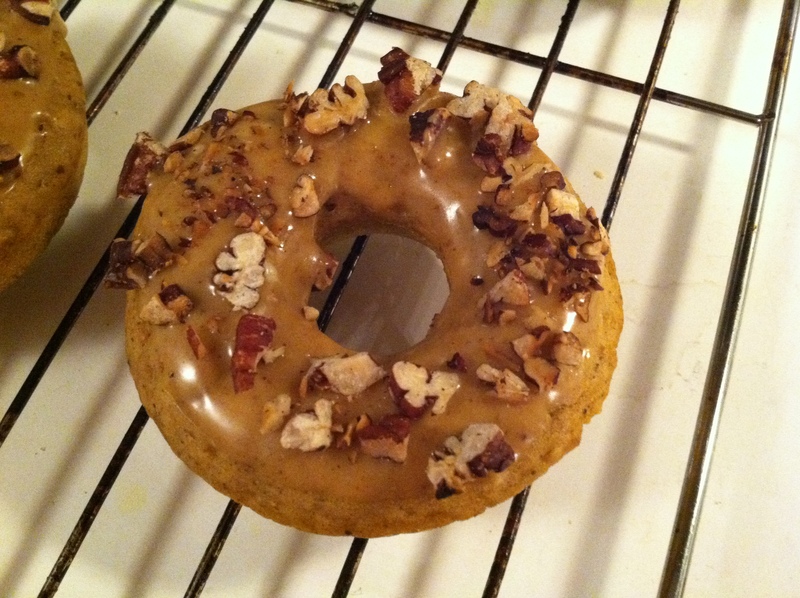 The 2013 Vegan Month of Food may be over, but the blogging momentum it gave me remains! In the aftermath of the MoFo, I have over 100 new recipes from my favorite bloggers bookmarked to make, plus a ton of my own recipe ideas in the works. So even though I have been relieved of the pressure to post nearly every single day, I definitely want and expect to post more regularly than I have in the past. 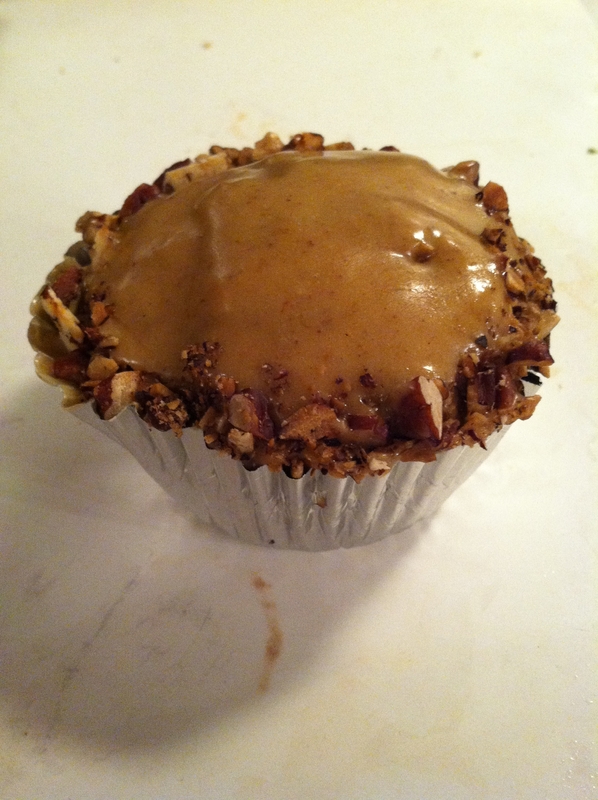 Today I have a new recipe to share! It’s for an easy pasta alfredo sauce that can be thrown together with minimal effort for a yummy weeknight dinner. The prologue to this is that it can be damned hard to fit everything into each day that I want to. I am fortunate enough to have a job that takes up only 8 hours of my day (this is not the case for pretty much everyone else in my profession, including H) and my total commute time per day is 40-50 minutes. Outside of those hours, I still want to find time to exercise, spend time with my husband and fur-babies, enjoy my cooking/blogging hobby, and maybe even unwind with a little TV. 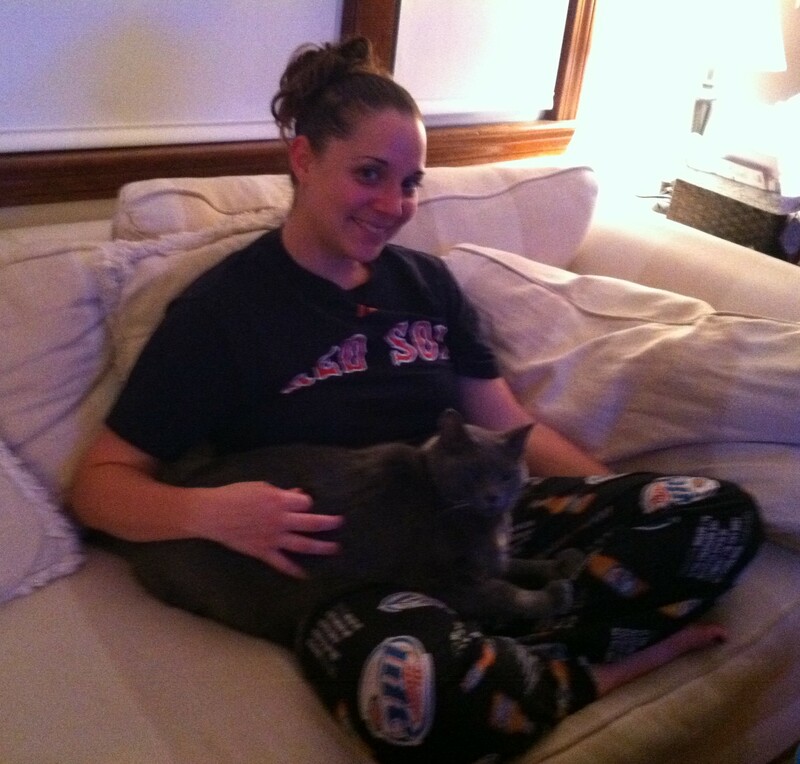 Marty and me watching some baseball. And yes, I am wearing Miller Lite PJ pants. And, as old-fashioned as it sounds, I like the idea of having dinner waiting for H when he gets home, which is typically a couple of hours after I do. Most of the time, though, I just don’t have the energy to do something super-involved. I’m sure I’m not alone in this! Last night, I noticed that I had a ton of assorted veggies and leftovers in the fridge, all of which were perfect for me (I am content to eat a dinner consisting solely of kale, broccoli, cauliflower, and brussels sprouts any night) but not so much for H. I realized there actually was pretty much nothing that he would want for dinner, and I didn’t want him to have to stop on his way home to pick something up (waste of time and money, my friends!). 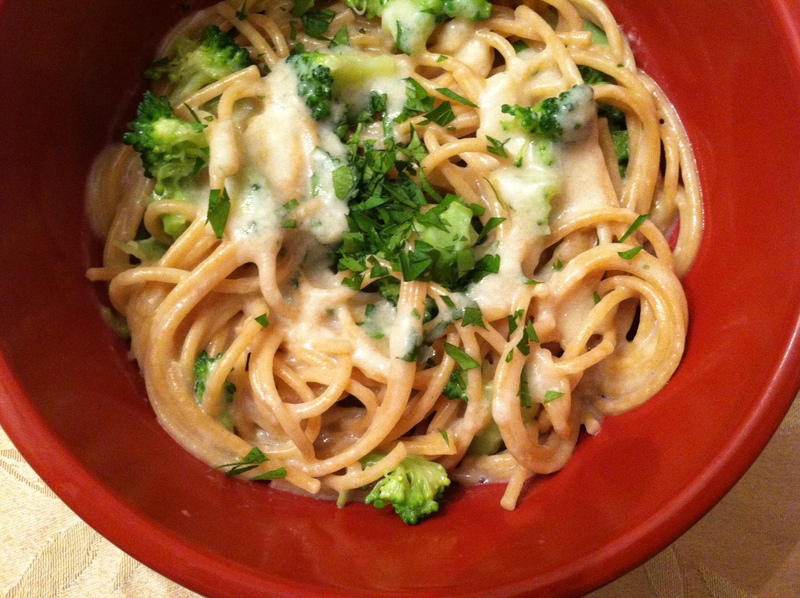 So I improvised, and this quick-fire alfredo dish was born! Once the soy milk mixture is boiling, immediately lower the heat, add the garlic powder and salt, and simmer 5-7 minutes, stirring frequently, until it thickens and reduces down slightly. Remove from heat and stir in lemon juice. Set aside to cool slightly. 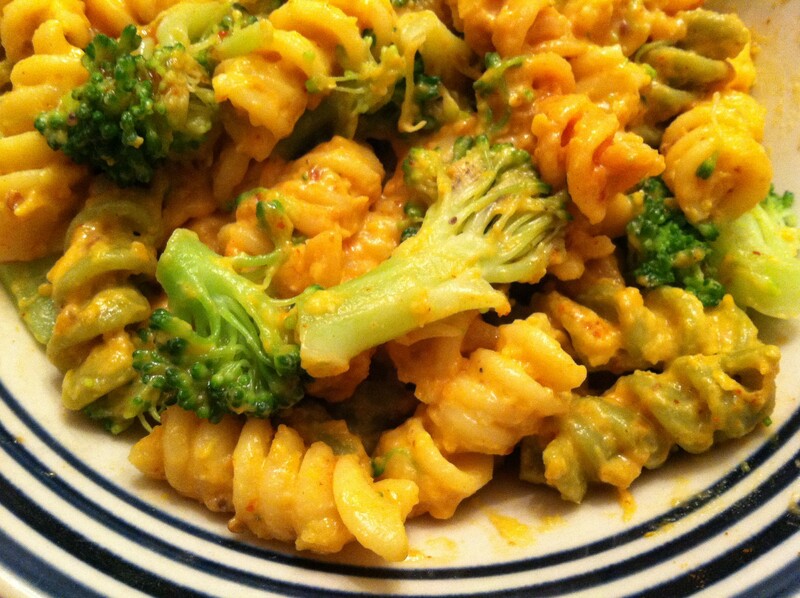 Drain pasta, return to saucepan, then add broccoli and sauce and use tongs to toss it all together. Separate it out into two bowls and add parsley and red pepper flakes, if using. Taste for seasonings and adjust as necessary (you may need to add more salt; adding the sauce to the pasta significantly dilutes its salty notes). Enjoy! This recipe turned out really satisfying, comforting, and filling. 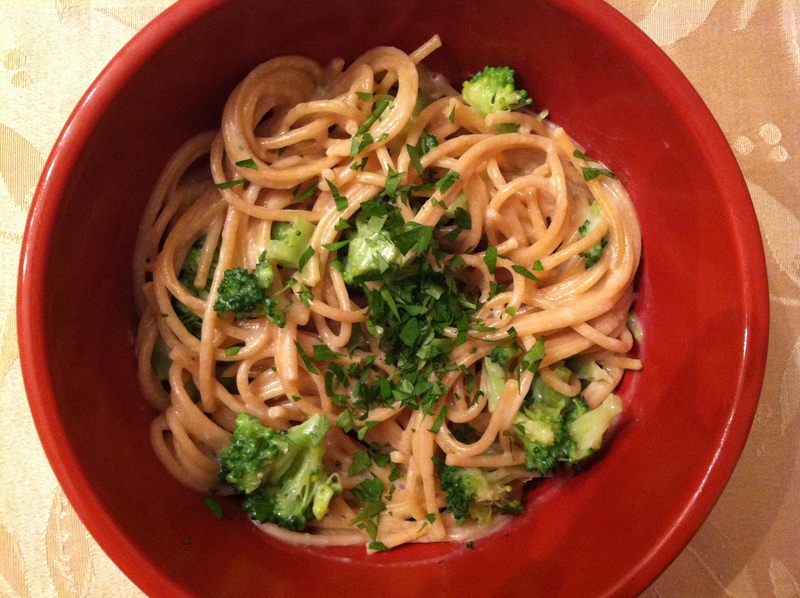 Obviously with more time/energy one can produce more impressive alfredo sauce, perhaps with a cashew base, but this one really works well in a pinch. What are your go-to weeknight recipes? Let me know in the comments! 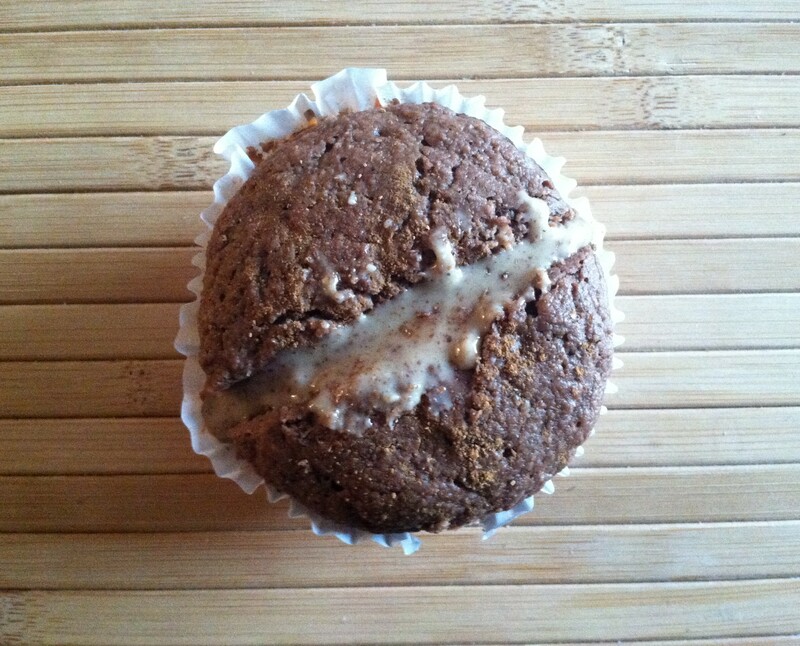 Coming soon: fall baked goods (because you know you can’t get enough) and a surprise product review and giveaway!! !